Let me take you back, back in time to a few weeks ago when I was in the deep trenches of The One room challenge. 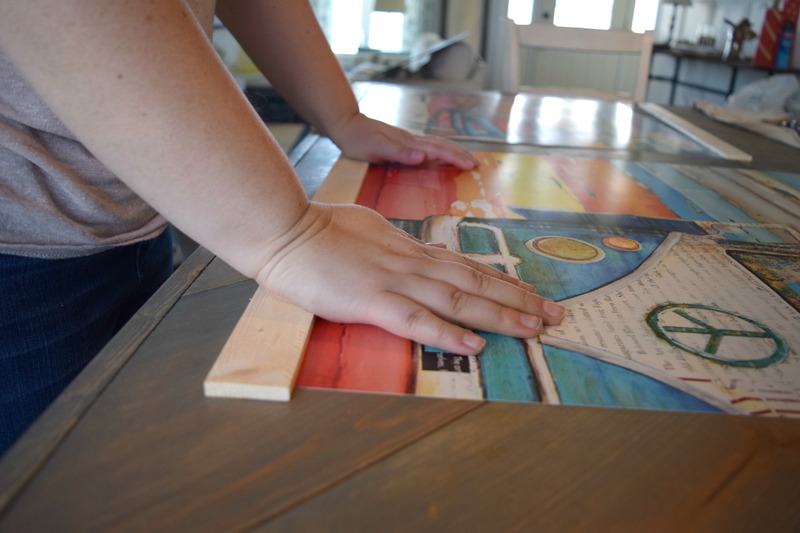 I was on a quest for some beautiful wall art pieces for my boys’ bedroom, but time shopping for the perfect pieces and my dwindling budget kept me on a tight leash. Then these beautifully bright and fun posters came into my life and I knew all was right in the home decor world. One problem though, I am sure the time will come when my Caleb & Gavin have some random posters on their wall, with (gasp) tape holding them up! Today is not that day. Mama is still in charge in this bedroom and I came up with a really easy DIY poster frame to make these posters become legit wall art. The mega post that is the built in bunk bed tutorial is coming. I have started to tackle that monster, and am hoping planning to have some downloadable plans for them once all is said and done. 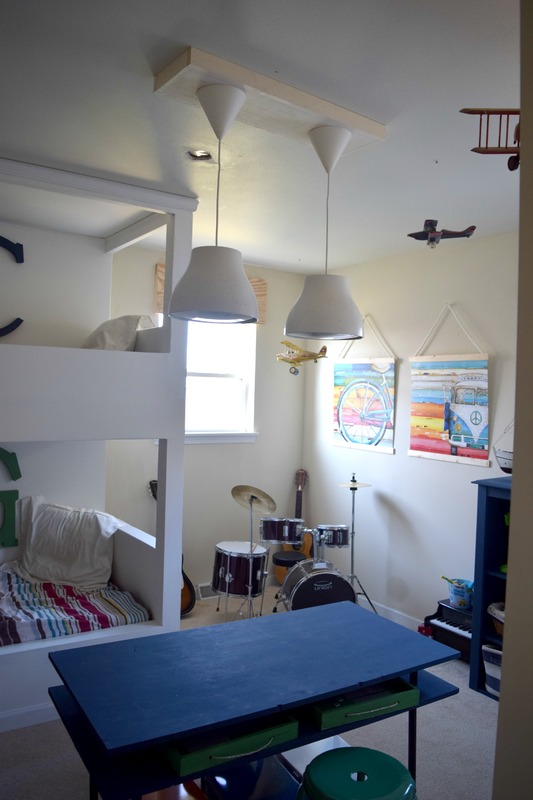 For now I have a ton of projects and simple fixes that helped turn this space into the dream boy bedroom you see today. These wall posters is one of those examples. I purchased them from Hobby Lobby. 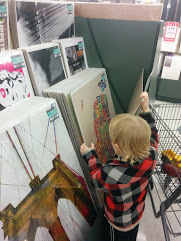 This is Gavin looking in the posters, he loved this part of the store! I knew I wanted something big and bright here. This wall is where the drums and guitars are. It is also opposite of the cluttered gallery wall, so keeping things minimal was best to offset all of this. But, I did not know what exactly I was looking for. These bright, fun, colorful pictures were found by my littlest little Gavin. We were perusing the posters in the store and he thought this one was “sick” which for all of you non-cool people actually means “awesome”. The plan was to make them look a little less poster-ish and more wall art-ish. not actual words, but you all know what I mean. I had some long and thin maple wood boards that I cut down to size for this. The plan is to have them be at the top and bottom of this art piece. 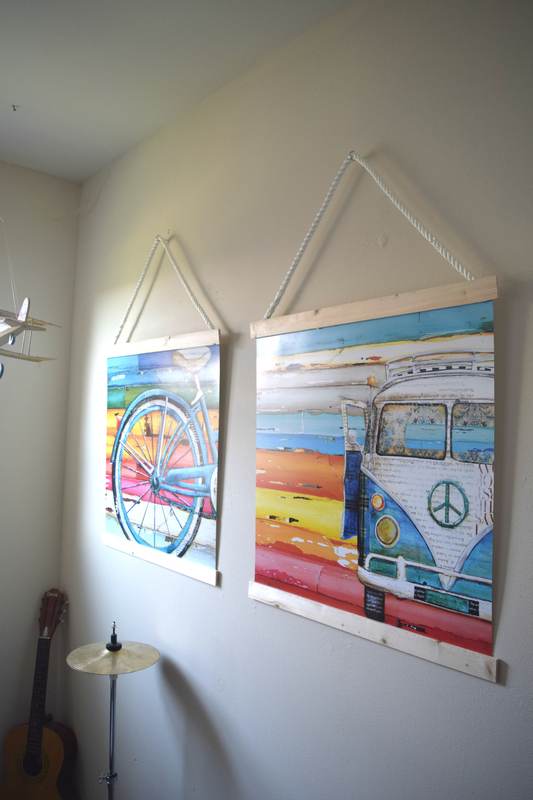 A modern twist for this DIY poster frame. 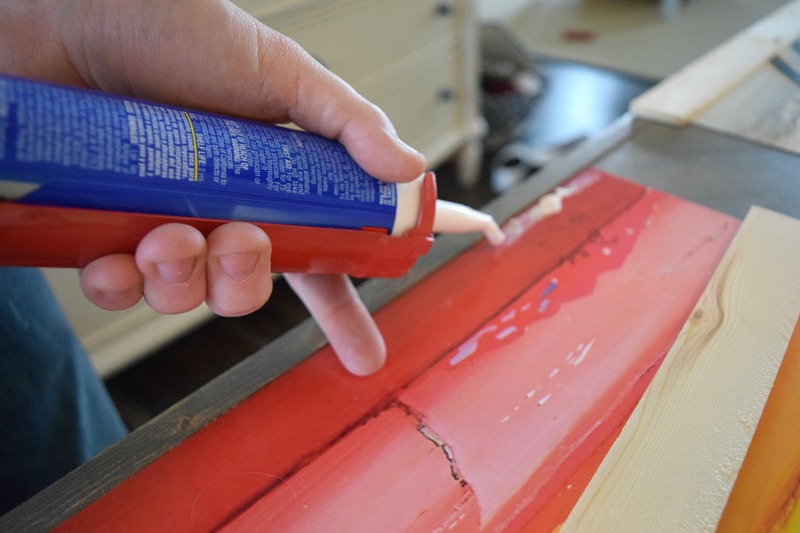 Using construction adhesive glue and lining it along the bottom and the top of the poster. “Push it, ha push it good”, push the wood down onto the glue. Pro tip, it does help to rap Salt-n-pepa “push it” while doing this. Just the truth. As you can see from the picture the wood I chose is a piece of light maple that is about 1.5 inches wide. I have a lot of elements of light or “naked” wood in this bedroom. I am loving the subtle and fresh feeling of this for the boys bedroom. 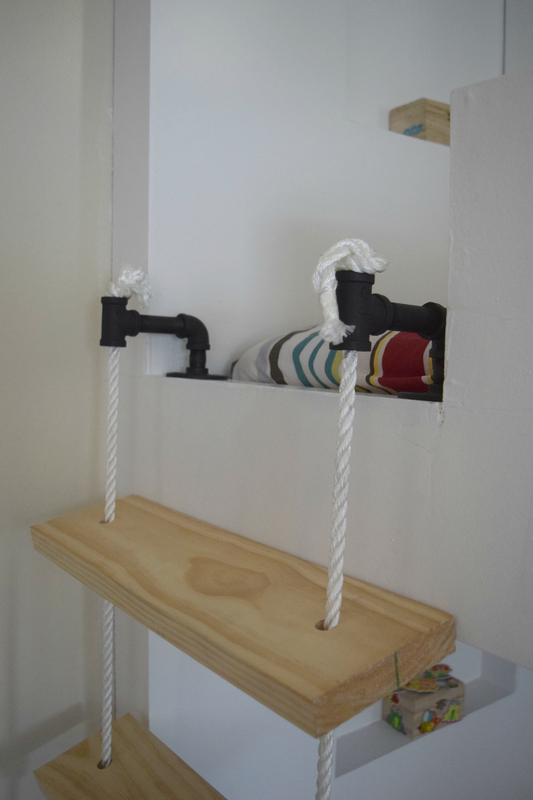 Here is the same rope and wood finish on the rope ladder that I used to make this DIY poster frame happen. I measured where I wanted each picture to lay on the wall, then cut the rope. 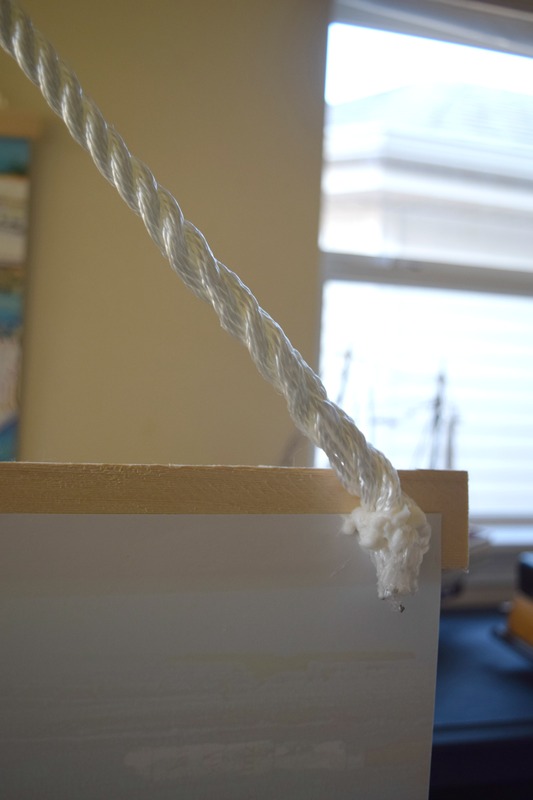 I used a sh** ton of construction adhesive glue on each end of the rope. Putting it in the back-top corners of each poster. I wanted the rope to be just as much a part of the art piece as the pictures itself. Helping the light wood and rope pop out in parts of this bedroom. Having it all flow together and feel thought out. I was worried if I did not use enough of the “naked” wood it would look undone versus planned out. I assure you, it was all planned out. 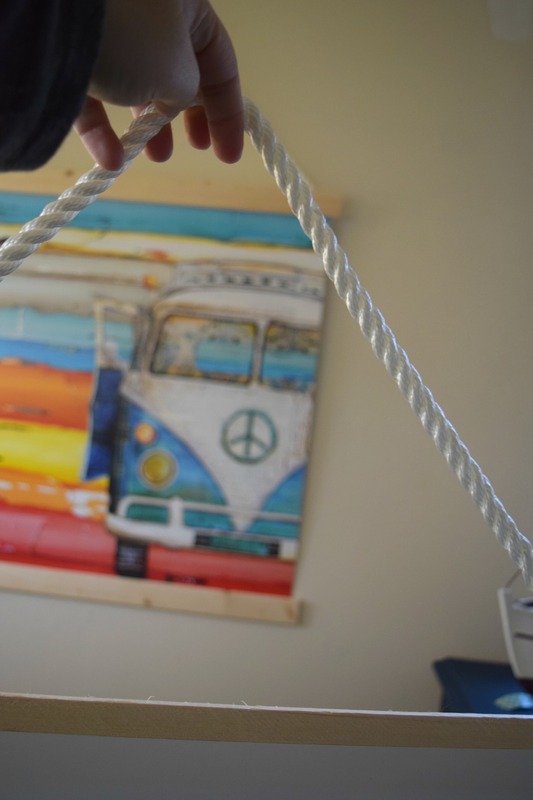 I used some simple silver hooks and put them into the wall to hang the rope on. I stuck a few pieces of double sided adhesive strips on the back bottom of the pictures. Just to make sure they did not move around too much once on the wall. That is it! They fit perfectly in the space, are just big enough. 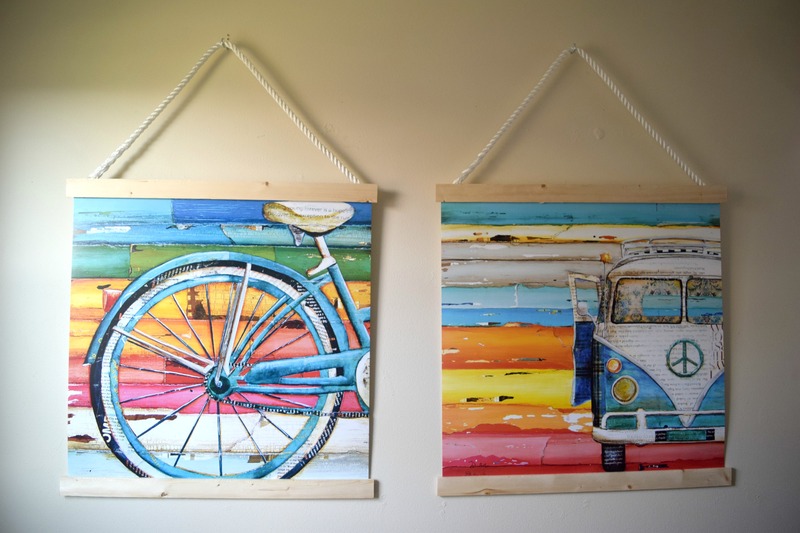 They are obviously bright and bold, but with the minimal decor in this corner and the light tones of the wood I think these wall art pieces can be a little bright and out there. This corner of the bedroom can handle it. I also love that it is a subtle play on the transportation with the bike and the front of a Volkswagen bus. I am loving this simple DIY poster frame project, and will be using it again in the future I am sure. 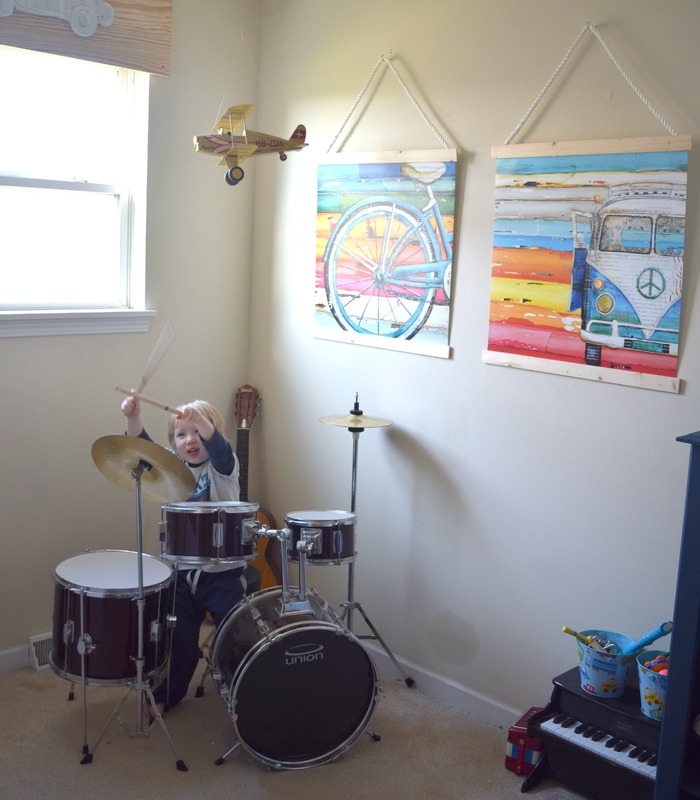 This bedroom is for both boys, but these drums are all Gavin. He is my wild man and will enjoy every single ounce of life. These wall art pieces are pretty much him in art form. I really like this project, because total including the prints I spent $40. Most of the cost was for the posters itself. 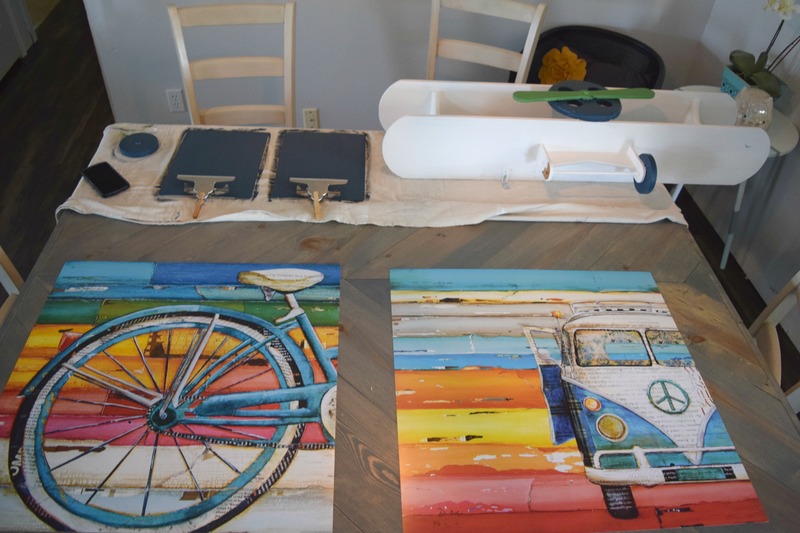 Buying big wall art can get pricey very fast, thinking outside of the box and ways to make large prints work is a good way of getting around that. 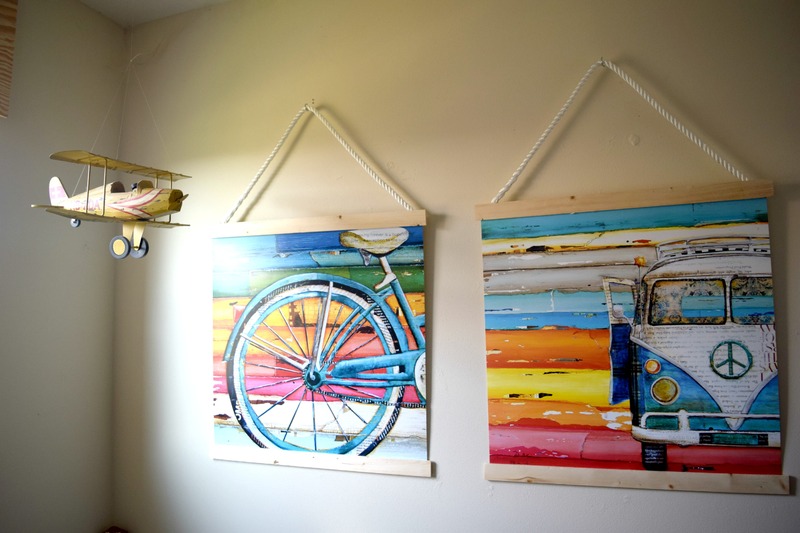 Creating the wall art you were dreaming of without spending a ton. Am I the only one that dreams in wall art? Anyone? You are reading a home decor blog, you are my peeps and I am sure dream the same way. 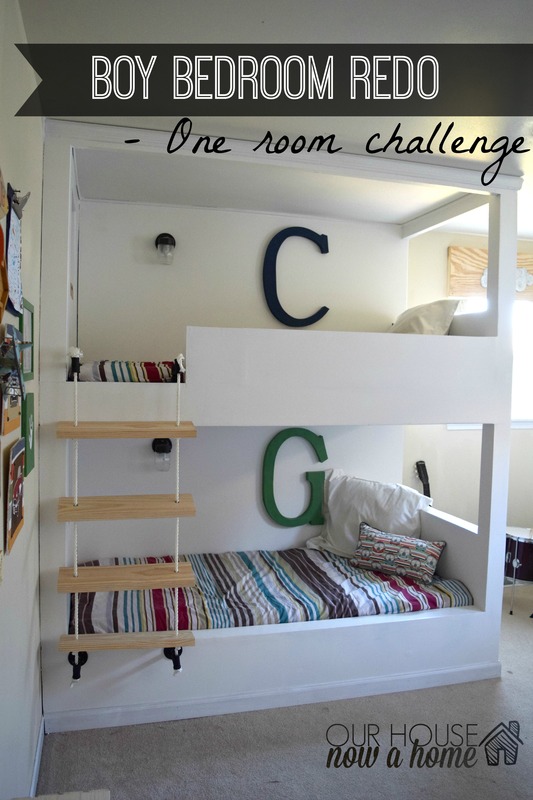 Be sure to follow along in these next few weeks, I will be sharing the massive built in bunk bed tutorial, along with a giveaway having to do with this bedroom. Also a few more projects, tutorials and crafts I did to make this bedroom happen. And, AND, AND…. I have a really exciting Holiday gift guide for all of you home decor lovers coming up at the end of the week with a fun giveaway! So much happening around here, be sure to follow along so you can get the latest and greatest from here. 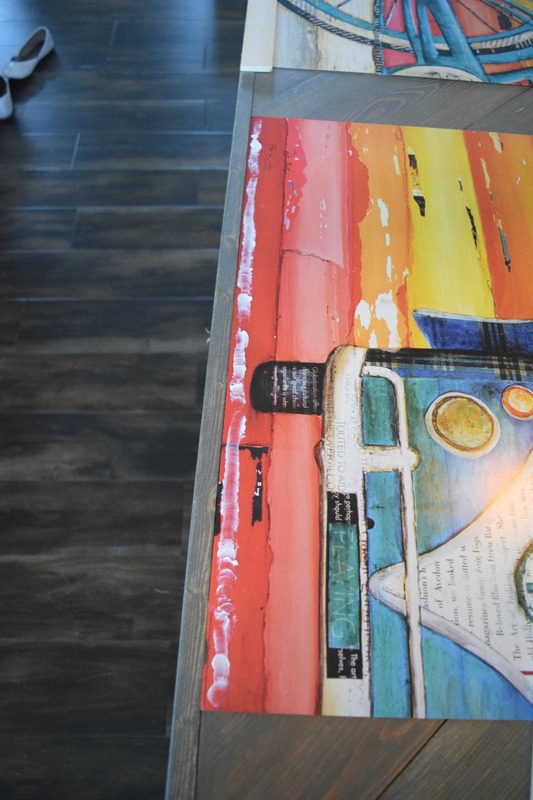 What is a way you use posters for wall art? Made any creative wall frames recently? 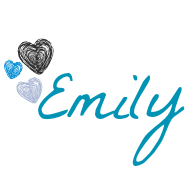 Emily – I love those posters and the frames really make them look like art work. Great idea. Love this idea!! I am so stealing fir my teenage daughters space this spring. Super easy and fast projects are my fav!! And those posters are fantastic. Thank you! I thought it was an easy solution to making posters look a little more polished and done. Love the DIY poster frame idea. I have some big maps I have been wanting to hang up and this looks like a great solution. Thanks! These frames would be great for large maps. You have a beautiful home! 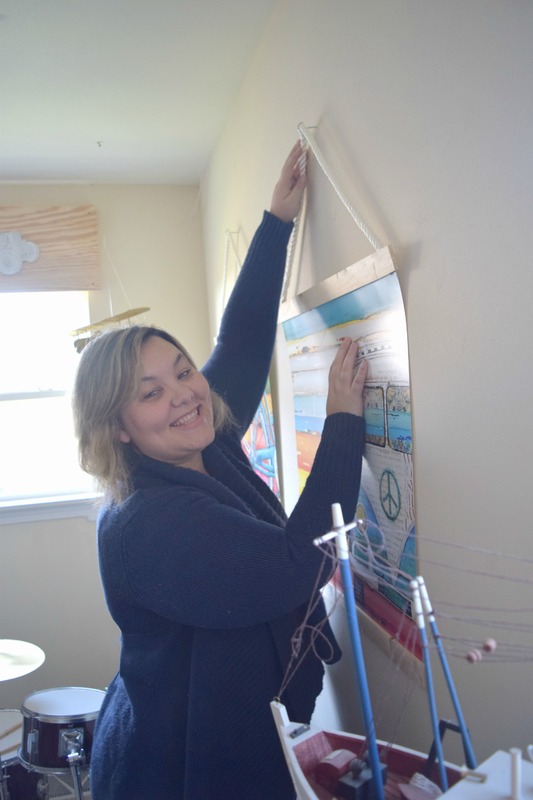 This is a great idea – I should try it on some of my posters. That came out really nicely! I would like to try that one of these days. This turned out so good. I love how clean they look on the wall! Thank you, I thought this wall needed to be less cluttered. This is adorable, I’m going to try to do this for the holidays. Can’t wait to see how it turns out. Thanks, good luck with your project! love this!! So so cute. They’re gorgeous. I love them very much. Thanks! 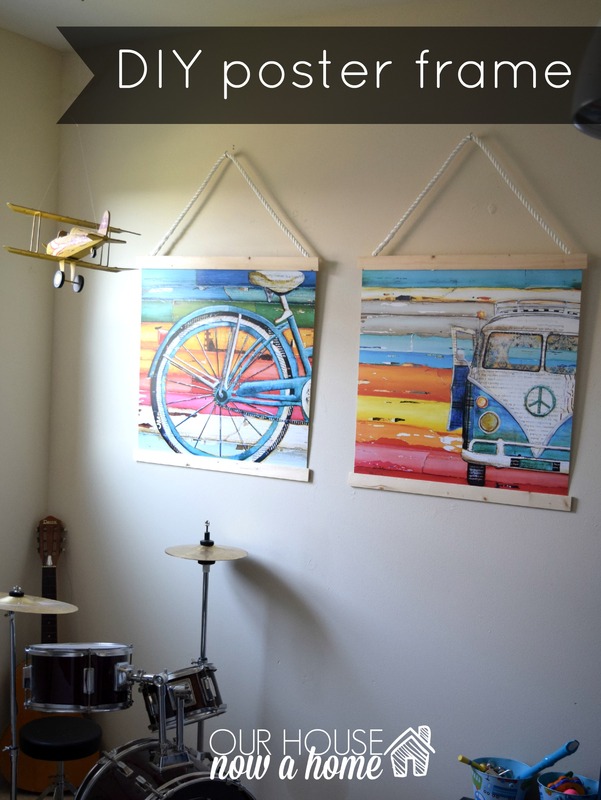 Posters are a great way to add wall art with not spending too much money. Great idea, Emily and I really love the posters that you chose! Thank you! I fell in love with the bright prints. such a brilliant idea! they look so good up on the wall!